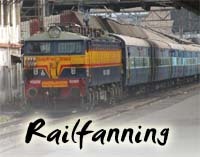 May 2006 : Summer in Bangalore - Railfanning! June 2006 : Thane to Panvel...Once again! Welcome to the Railfanning page!!! If you are a railfan, then you are at the right page! Unfortunately, due to server space restrictions, all future Railfanning reports will now onwards appear at my blog. A link to the same is given along with the logo. Your continued patronage is requested. The images of Railfanning section can be seen by clicking on the "Galleria" link above. Last Updated on June 16, 2006 at 1421 hrs IST. Best viewed at 1024X768 pixels. Copyright © 2005-2006, Binai.K.Sankar. All rights reserved.